The past week I've been laid up with a cold. There are colds and there are colds, and often I can fight them off, but this one had it in for me! A real energy sapper. Fortunately, I don't need to get out of the house to go to work every day, and I've been able to keep up with the homeschooling; but there has been a lot of napping on the couch! Yesterday I just couldn't do that any more, and here's the result. I'd started the kestrel the night before last, so I finished him off. 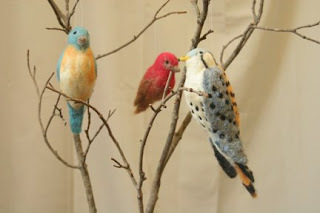 I haven't seen any purple finches or house finches this winter, so I had to make the purple finch, and the bluebird had to be made to help make my bird display more colorful for my show on the 21st. See the 3 birds on the tree? When I go to shows the tree is full of birds. Last summer at Coventry, I heard that shoppers at the Market were walking around talking about the "bird lady". That's me!